So, this past Wednesday at our Ash Wednesday service as we entered into the season of Lent, I preached and mentioned that I was a bit tired and run down with the drudgery that Lent is approached with at times. 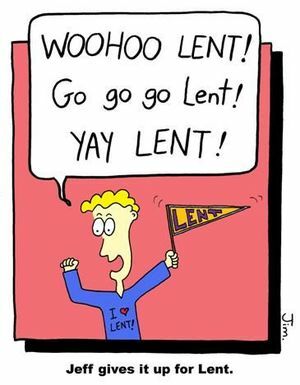 Mostly, I’m tired that I myself seem to ‘lament’ this time of the church year, especially when Lent is one of my favorite seasons. This season of the church year helps us focus on God’s presence in our lives. The practice of ‘giving something up’ for these 40 days, directly corresponds with the time that Jesus spent in the wilderness as he fasted for that same period. Yet, as we give something up, we tend to do the opposite of what our Lord calls us to do from within our Ash Wednesday text. We DO at times scrunch our face and look dismal as we compare the things we are ‘suffering’ without with those around us. I’m tired of lamenting my sacrifice. Instead, I wonder and ponder what it would look like to approach the season of Lent with a sense of joy. Seriously. And not in a masochistic way. But, a sense of joy knowing that what I’m doing – what I’m giving up or taking on – is something that will help me see and know God’s presence in my life more fully. Where I remember that it is God who makes me complete and whole, not the thing that I give up (or take on). And, so the challenge with that is weaving joy into these texts each week. And this first week? Jesus being tempted by the devil. That’s a difficult one for sure. This is a story about Jesus’ life that takes place right after his baptism. It comes right after Jesus is washed and God speaks over him and states who he is – God’s son – and that he is exceedingly pleased with him. And this got me thinking. After his baptism, after being told that he is good in God’s eyes, that is when he enters into the wilderness. And after that time in the wilderness is when the devil confronts him. God reaches out to us in our baptism the way that he reaches out to Jesus. We are washed and welcomed; we are proclaimed to be good. God’s love and faith are poured into our lives in those waters. In those waters we discover who and whose we are. In those waters we are claimed as one of God’s very own. God’s love is bestowed upon us there. Then after that, we wander. We get mired in the wilderness. We are famished. Then the hurdles, the obstacles, the temptations litter our paths that God has us on. And it stinks. A lot. Our minds race. We question our identity in God. We feel lost. We feel distant from God and from one another. We feel like we’re being punished. We feel like God’s love is absent from us. We forget what God has already done and made known. We forget that we are already loved by God. We forget that God is with us in the wilderness, through the temptations. God is holding on to us even when we stumble and fall. Not to chastise, not to demean, not to tsk tsk us into oblivion. But, to remind us that all is not lost. Hope remains. This love is strong and firm. During the season of Lent, we approach it with lament because we feel we have drifted so far from God and that we need to do something to get back in God’s good graces. That we need to do something to jolt us back on the path towards God’s intent for our lives. We come shuffling, as we fall to our knees asking for God’s mercy and forgiveness. To spare us from the trials and tribulations of sin in our lives. To be strong in the face of temptation and to apologize profusely about how far we’ve fallen. At times, it feels like Lent is our attempt to sway God’s opinion about us. Our sacrifices, our fasts don’t help at all in getting God to notice and love us. They aren’t signal flares to the Lord so that God will finally accept us. No, not at all. When we fast, when we sacrifice, we get to know what God already knows. That what makes us ‘us’ is God. Those things that we give up are not the things that fulfill our lives, make us whole, and show us how loved we are. Yet, as we focus on God through the absence of those ‘filler’ things in our lives, we get to see and know more fully what our God already knows. We are loved. We are made whole. We are complete in the eyes of God. That is indeed the joy of Lent. Yes, we do indeed sacrifice. We do indeed fast. We pray. We worship. We attempt to stand firm in the face of temptation. Not so that God will notice us, love us finally, or even more completely. We fast so that we might know what God already knows. That we indeed are loved and made whole in God’s life and acceptance and welcome of each of us. There is joy in that truth. There is joy in the truth that when we wander through the wilderness, when we are famished, when we are tempted – God is there with us. Holding on to us. Guiding us. Letting us know that we are already loved fully. And when we know what God already knows? We wander less, we stay close, we see God in the center of our lives and why would we want to turn away from that love and presence? That is the joy of Lent. Journey in that joy. Amen.